In 1990, one of my closest childhood friends gave me the modern classic Gift From the Sea by Anne Morrow Lindbergh, with a lovely inscription in the front cover. I recently reread the slim book (my third time) and found the lyrical writing and insightful thoughts more resonant than ever. "With a new awareness, both painful and humorous, I begin to understand why the saints were rarely married women. I am convinced it has nothing inherently to do, as I once supposed, with chastity or children. It has to do primarily with distractions. The bearing, rearing, feeding, and educating of children; the running of a house with its thousand details; human relationships with their myriad pulls - woman's normal occupations in general run counter to creative life, or contemplative life, or saintly life. The problem is not merely one of Woman and Career, Woman and the Home, Woman and Independence. It is more basically: how to remain whole in the midst of the distractions of life; how to remain balanced, no matter what centrifugal forces tend to pull one off center; how to remain strong, no matter what shocks come in at the periphery and tend to crack the hub of the wheel." "For life today in America is based on the premise of ever-widening circles of contact and communication. It involves not only family demands, but community demands, national demands, international demands on the good citizen, through social and cultural pressures, through newspapers, magazines, radio programs, political drives, charitable appeals, and so on. My mind reels with it. What a circus act we women perform every day of our lives. It puts the trapeze artist to shame. Look at us. We run a tight rope daily, balancing a pile of books on the head. Baby carriage, parasol, kitchen chair, still under control. Steady now!" Her words apply perfectly to our harried lives today, with social media and the 24-hour news cycle (can you imagine what she'd think of all this?). I could fill pages quoting passages in this review - she shares shrewd, intuitive thoughts on almost every page of the book. It will takes me hours to write all the passages I marked in my Quote Journal! As I envied her two weeks alone at the beach, I inwardly cheered for every page, thinking, "Yes! That's it exactly!" It's amazing that this slim book is so relevant and moving more than 60 years after it was written. As with my friend's thoughtfulness toward me, this timeless book would make a perfect gift for any woman in your life. Though my copy is a 20th anniversary edition, the version now being sold is a 50th anniversary edition, with a new introduction written by the author's daughter. 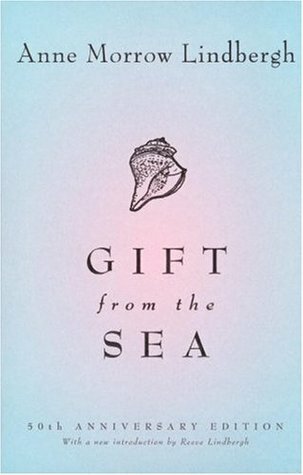 Or order Gift From the Sea from Book Depository, with free shipping worldwide. I like the little of Lindberg that I've read and am glad to hear this one still feels relevant. This is all I've read of her work - I should look for more. What an interesting approach to a memoir! And I definitely agree that the quote you shared still feels timely. I really enjoyed it - again!